Baked frittata. 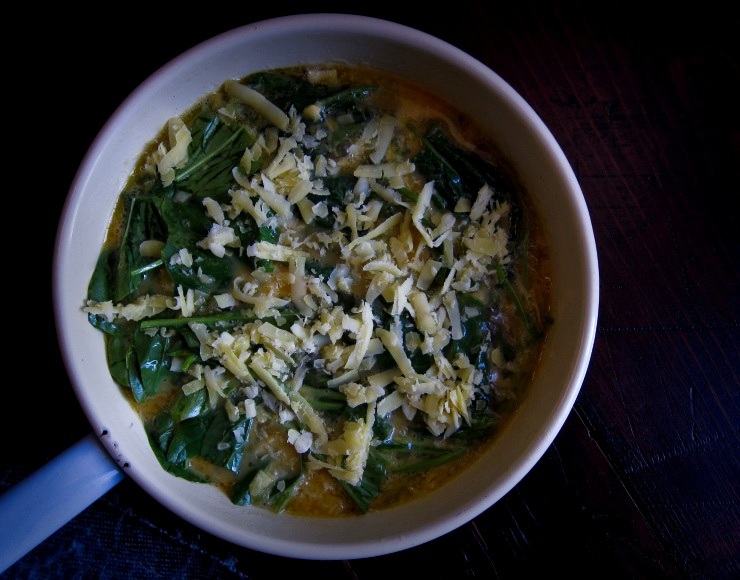 Easy, cheesy, spinachy. You're just so good, so easy. Delicious warm, but also cold. Suitable for all seasons: cool and convenient picnic fare for summer, warm and comforting at home in winter. I think I love you a little. Or a lot. This can be as simple as anything. A bit of butter, a bit of garlic. Whisked eggs and yoghurt. Spinach and cheese. But of course, I can get fancy with you, too. I can stir in some basil, throw in some chopped sun-dried tomatoes. So many possibilities, so many variations of deliciousness. I gleefully top you with cheese before putting you into the oven. Who doesn't like a cheesy crust, after all. How my easy cheesy spinach frittata looked before it went into the oven. Just in case you're interested. The hot oven worked its magic. You look nice, frittata. Oh yes, you do. 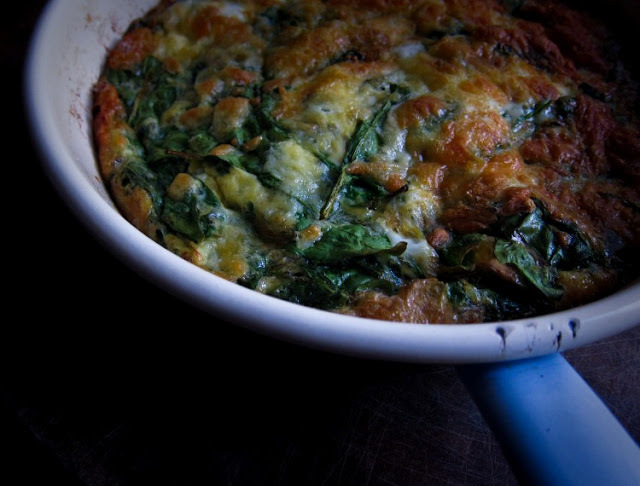 Easy cheesy spinach frittata, hot from the oven. 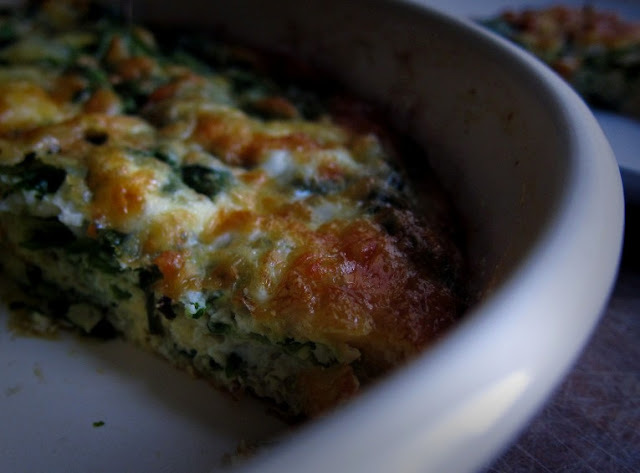 Cross-section of easy cheesy spinach frittata. Preheat oven to 220°C (425°F) fan-forced (200°C/390°F conventional). In a 20cm/8" oven-safe pan, warm up the butter over low to medium heat and gently fry the garlic until soft and golden. Swirl to coat all inner surfaces of the pan with the melted butter, and spread out the garlic across the pan with a fork. In a bowl, whisk eggs with salt and pepper until the whites and yolks blend together smoothly. Gradually trickle in yoghurt, whisking all the time. Stir through the spinach and 1/2 cup cheese, as well as the basil and sun-dried tomatoes, if using. Pour the egg mixture into the pan. Scatter the top with the remaining 1/3 cup cheese. 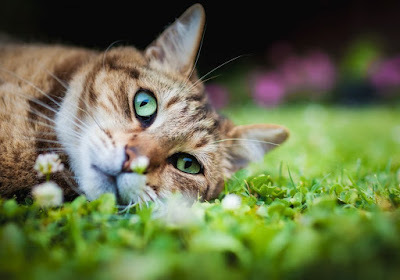 Bake in the preheated oven for approximately 15 minutes or a little longer, until a puffed golden with hints of brown. Suitable for breakfast, brunch, lunch, dinner, snacks, picnics, anytime really! * I've made this frittata with both roughly or finely grated cheese. I've tried it with different cheeses - cheddar, grana padano, parmesan / parmigiano-reggiano and pecorino romano. I've found that with a very salty cheese like pecorino, there was no need to add salt at all. I love it too! It's Riess, an Austrian brand that does enamel kitchenware. I got it at a discounted price ($20) because it had a slight chip on the handle. Oh yum! This looks delicious. That pan is pretty cute too. Must try! That combination of spinachs, yoghurt and dried tomatoes is gorgeous. I love a frittata! We tend to put lots of pumpkin and sweet potato in it, especially in the cooler months to give it a bit of body. Yours looks delish though! perfect lunch or dinner! I just made an ate pretty much an entire frittata... heh. with LOADS of cheese on top. I know - it's SO easy to eat a whole one. I love frittatas they make such a good week night dinner! this looks so good! Your pan is a great buy, I like the little chip, it adds character! 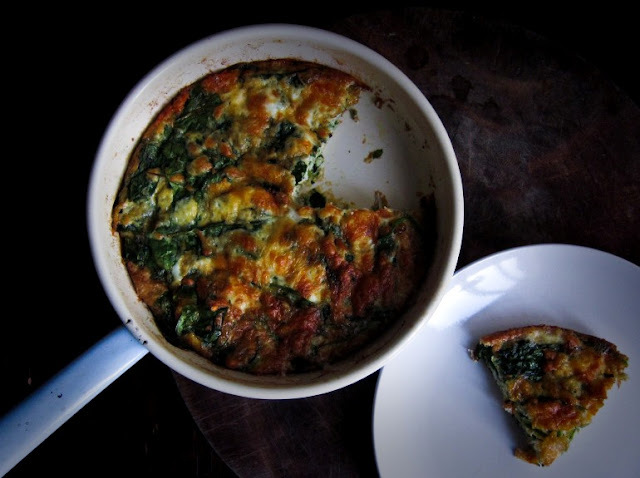 Too right - frittata is both great cold with a side of summer salad or warm during those cold winter days. Love the amount of cheese - YERM! Believe it or not. I've never had a frittata in my life! that's one good looking frittata :-) haven;t made one since summer when i had loads of dad's zuchinis. time to make another one. with cheee on top! Ooh a summer frittata with zucchini must be tasty! Love me a good frittata... i think I like saying the word so much! Frittata!